If you are an interest-rate-starved banking customer, this EverBank Online Bank review might come in handy. Lots of people consider using this institution because of the (relatively) high rates they pay. 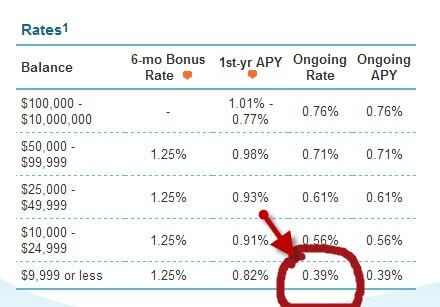 And Everbank’s rates are really good. Here’s a Pilgrim look at our EverBank review. But let me be very frank from the get-go. There is much more to consider than the interest they pay. As you’ll see, it can be a huge waste of time to open an account based on the rate alone. Interest income is still a big consideration so let’s first look at the rates EverBank pays and then we’ll consider the more important banking proposition this institution offers. 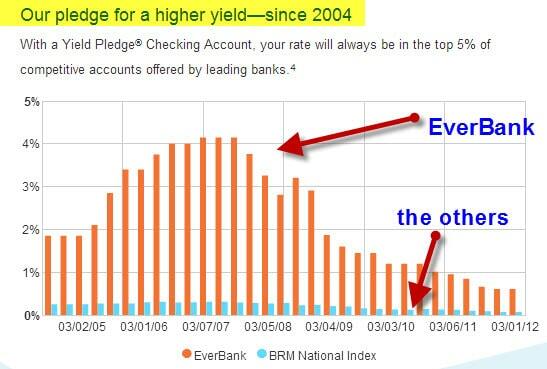 Since 2004, EverBank has pledged to pay you a rate that will always be in the top 5% of competitive accounts offered by leading banks. They calculate this based on the Bankrate Monitor’s National Index on the last Wednesday of each month. This is Bankrate.com’s weekly national survey of rates. They define “competitive accounts” as those from the top 5 banks and top 5 thrifts based on deposit base in the top 10 banking markets in the United States. So it’s not to say that you will always get the best interest compared to any other bank. But with EverBank you’ll always get top-tier rates compared to other top- tier institutions. Seems like a good deal to me. Their High Yield Savings currently pays 18 times the national average. Their High Yield Money Market currently pays 8 times the national average. 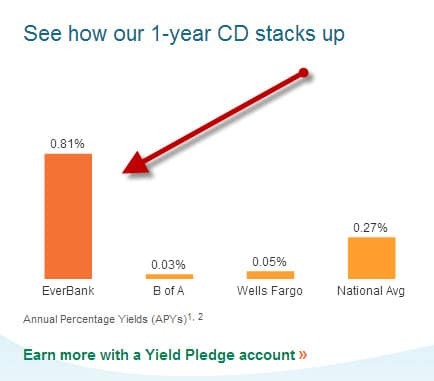 Their High Yield C1-Year CD currently pays 4 times the national average (see below). As you can see, their rates are consistently higher than most other banks. What’s not to like about that? Does EverBank offer high teaser rates just to lure you in and then put the screws to you like other banks? Nope. As you can see the rate drops after 6 months but you will still earn a relatively nice amount depending on the balance you keep. Most banks won’t pay you a dime on checking no matter how large your balance is. EverBank offers a very refreshing change. To open an account, you are going to need $1500. There are no fees to open or maintain this account and you have unlimited check writing and deposits. If you want Online Bill Pay (which I strongly recommend) it’s free if you maintain an average daily balance of $5000 or more. If your average balance dips below that level, you’ll have to pay $8.95 a month for Bill Pay. If you open a High Yield Money Market you’ll earn a bit more interest but the government restricts your total number of free transactions to 6. Beyond 6 transactions, you’ll have to pay $10 per transaction. Also, with the High Yield Money Market, if your average daily balance drops below $5,000, they’ll charge you $8.95 a month just to maintain the account. If you open a checking account and aren’t 100% satisfied, the bank is going to send you a crispy $50 for your trouble. All you have to do to get this $50 is to use online bill pay at least 3 times and close the account (and tell EverBank the reason for closing) within 30 days of your 3-month anniversary. I like it when somebody puts their money where their mouth is. Booyah. Yes. I spoke with customer service again and they confirmed that it’s no problem to download data into most programs. I like this feature of course but it’s pretty standard. If anything, I’d be alarmed if EverBank wasn’t set up to provide data downloads. 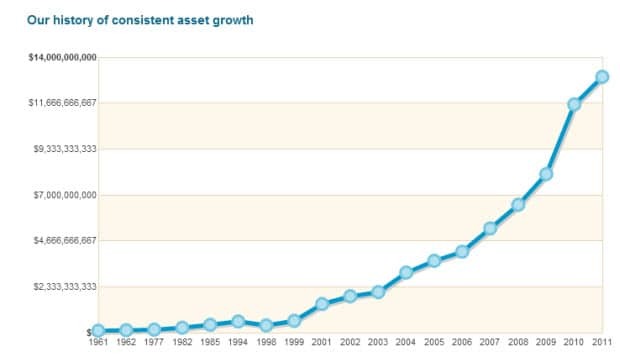 The bank has been in business since 1961 and their growth has been nothing short of astounding. They have received numerous accolades and awards from Bankrate, Money Magazine and Kiplinger’s. 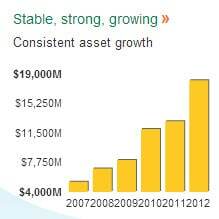 Since 2002, the bank has grown by over 500% which is a pretty impressive feat too. I personally wouldn’t have a problem doing business with this firm as long as my deposits were at or below the FDIC insurance levels which are currently $250,000 per account. EverBank’s rates are extremely attractive but let’s face reality. Interest rates are still hovering close to ground level for all the banks right now. Of course it’s important to get the most you can. But even the highest paying institution won’t put all that much money in your pocket compared to the more average interest payers. That’s why service is what it’s all about in my opinion. Fortunately, this is EverBank’s strong suit. I called EverBank and spoke to Lauren without having to go through a maze of phone system purgatory. I like that. And Lauren actually amazed me. She answered all my questions completely and really knew her stuff. Plus – and here’s the bonus – she was located right here in the USA and is a native English speaker. Muy Bien. And the service doesn’t stop at the end of a phone line. Look at the home page. It tells you exactly how to get in contact with the bank anytime you like. I like the fact that they answer the phones 24/7. It makes me feel appreciated. Also, the “contact” page tells you how to send them documents via snail mail or email. The page tells you how to contact them by Twitter too. And it goes even further. It tells you right on the “contact” page how to wire money and how to set up a direct deposit or ACH/Electronic transfer. It even tells you how to contact the bank if you are traveling abroad. I have never seen any institution make it so easy to be in touch and I appreciate that big time. Somebody down at the bank is really thinking about user experience. Of course if you prefer bricks and mortar (and you live in Florida) you can always drop by and do business. Right now, the only branches they have are in the Sunshine State. But you can be anywhere in the world and still take advantage of EverBank’s great service. Me likey. When dealing with your bank, it’s nice to know you can get at your cash if need be. I took EverBank’s ATM system for a test ride and wasn’t disappointed. They provide access to 500,000 machines nationwide and when I simply input a zip code into the search engine, 5 ATMs immediately showed up. Convenient. They don’t charge ATM fees. And if the machine you use charges you, EverBank will automatically reimburse you as long as the transaction occurred in the United States and you keep a minimum balance of $5000 or more. The EverBank account opening process is easy. You just have to provide your Social Security number, your address and employment history. They might ask you for a little more information. You may have to provide a valid driver’s license and/or a utility bill or rental agreement/mortgage statement. This isn’t a big deal if you ask me. I have reviewed a number of financial institutions. All of them use a similar process when you open a new account. Banks do ask questions and put holds on funds when you start your relationship. Big deal. All good online financial institutions do this because they want to reduce the threat of fraud. They want to make darn sure it’s you opening an account in your name. You should appreciate that, not be bothered. Some people complain about this process and I get it. But in my opinion, these people don’t really understand how the account opening process is designed to benefit and protect them. I don’t want to belabor the point. But people who focus on the process of opening an account miss the boat. You have to jump through some hurdles to open an account anywhere you go. It might take one hour to complete the process (net time) over a week or so and then you will be good to go. You get it done and you put it behind you . Then, if you’ve opened an account with the right financial institution, you reap the benefits for years and years. That seems like a good trade off to me. That’s why I don’t like hopping around from bank to bank. But it’s also why I love EverBank. Once you open your account, you know you’ll always earn a very competitive rate. You won’t need to hop around and you can spend your time doing more important things – like reading my blog. As I said, you make a smart banking decision when you consider all the services you might need from a bank over the long-term. That’s why I suggest you take a very good look at EverBank. Consider the menu of services it offers for personal banking. On the personal side they take care of your checking, savings and long-term deposit needs. They offer very competitive mortgages as well. OK. Let’s keep going because the services don’t end there. EverBank also offers a complete line of business banking services. And here’s a nice surprise; the business checking and money market accounts actually pay a good interest rate too. That’s a nice change. EverBank also offers business CDs, credit cards, cash management, global transaction and sweep services. And they offer merchant services, remote deposit and overdraft protection. Comprehensive. I have a small business and I like to keep things simple. I need to use one bank for both personal and business. Most of the online banks I’ve reviewed offer only personal banking services. 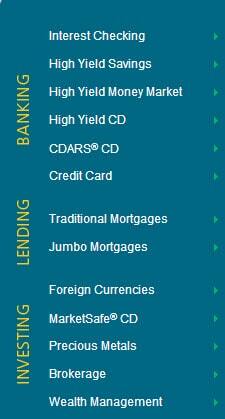 This wider menu of products and services is one major advantage on Everbank’s side. And when I spoke to Lauren, she told me that it’s very easy to transfer money between my business and my personal accounts even if I have different tax ID numbers. They link them up for our convenience. As I said, somebody up there is thinking about customer experience. I grilled customer service 4 times. They answered all my questions and they made it very easy to understand the products and services. If I want to be a complete unreasonable stick in the mud, I guess my only complaint would be that they should present a matrix explaining the pros and cons of each account. That would have made it a bit easier to decide which account works best for me. Had they done that, it might have saved a few phone calls. That’s it for the complaint department. I must tell you, I am a big fan. This EverBank review blows the doors off of any other bank I’ve reviewed for the right person. If you like to earn interest on your checking account without paying fees and enjoy great customer service, put EverBank on your speed dial and open your account today. I have to complain about the title of this article. The title sounds negative, but you keep extolling the virtues of this bank. Why not title the article: Everbank, a great banking option” or some other positive sounding title? Thanks James. I do that because I don’t think it’s about rates alone. We use Everbank in conjunction with Ally Bank. The combination is powerful. We haven’t stepped into a bank in many years. There’s just no need. Rates are excellent. Software (with both) makes everything simple.Customer service is a dream. We used Chase for 30+ years. Chase was good……. but doesn’t meet the Challenger compared to these two. That is awesome. How do you use Everbank? How do you use Ally? Thanks…. While I realize we’re talking about two separate issues here, I’ve dealt with Everbank with my mortgage. They raised my payment $300.00/month. The Independent Foreclosure Review was complete and obvious errors were found but a little too late. I’m disgusted with Everbank, but business as usual for them. Did you have an adjustable mortgage? CJ, thanks. But remember that you really can’t compare a CD to a mutual fund. The risks are completely different. Why did you buy that CD in the first place? If you need that money over the short-term, the fund may NOT be the best move. Is that money long or short term? Thanks! If you get a CD be prepared to keep it to term. The early withdrawal fees are extreme compared to other banks. They want to make sure you do not take out the money ahead of time. Any thoughts on their foreign currency CD’s? Not really. I consider CDs as risk-averse money. So why take the foreign currency risk? What has been your experience? I have not yet purchased the foreign currency CD’s. I am wondering if this is a good way to get some money out of US dollars and into another currency such as Canadian or Aussie money. People who are concerned about diversifying out of US dollars can indeed consider foreign CD and also foreign country or international mutual funds and ETFs. Even if the market was stable, if the dollar dropped, those funds might rise relative to the dollar. Either approach has risks though. What is your big concern with the dollar right now? I think it is prudent to have some money in a place other than US Dollars. My concern is the 17 Trillion Dollars of debt the US Govt. has racked up. I feel this won’t end well. Human history has proven time and time again that debasing the currency leads to disaster. I’m simply trying to hedge my bets a bit. We’ve had EverBank accounts for many years and no complaints. We’re currently earning 0.76% on a savings account, not the highest available in the industry, but not bad by today’s standards. Since we’re US citizens living outside of the US, we also appreciate EverBank’s World Bank currency options and exchange fees, which I’ve found to be very competitive. Thanks Jason. I agree that it’s about more than rates. And I was really blown away the deeper I dug into this company. I am a big fan. I sense they really get the business they are in. Glad you are having a good experience with them as well. What a great (thorough) review! I’ve loved EverBank because of their great interest rates, but it’s also nice to hear that there is more to them than just a few extra dollars in interest each month. Having great service is a big deal and if you’re going to have an online presence then you have to excel in that category.